The balance is there, the complexity is there. It doesn't have that certain je ne sais quoi that earlier WhiskyNerds bottlings had, but overall this is a beautiful whisky. Sweet and savoury with a delicate, but incredible balance. Lots of little intricacies here, that interplay wonderfully well. Briny, with hints of rubber gloves, wet pebbles, and peat smoke. There's a touch of glazed barbecued steak as well. All of this coated by a thin layer of redcurrant and strawberry. Finally a touch of aniseed even. Fairly salty and briny, with a touch of cured meat and soft peat smoke, followed by a whiff of cigar tobacco and menthol. A bit of licorice too, as well as a subtle spiciness. Lingering menthol and subtle peat smoke, and finally a touch of orchard fruits. Medium to long. Nice, balanced, peaty but not to much, great cask influence and juicy liquid. 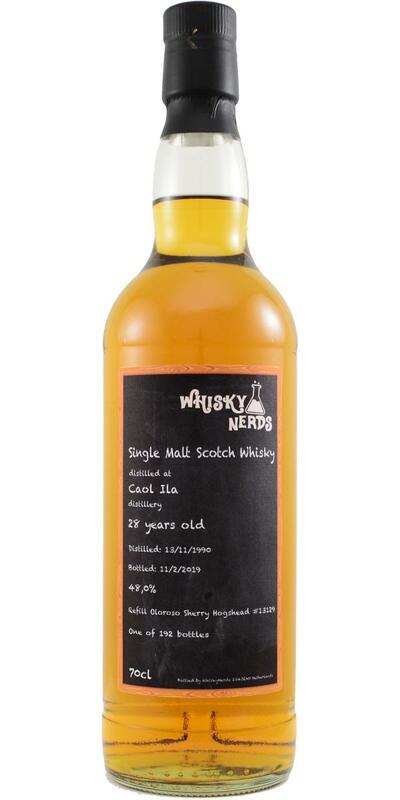 Quite some stewed fruits, some additional typical Caol Ila flavours and all so balanced. Nice one!